"No one has said 'no'" to the redistricting plan Quick asked House Legislative Counsel to draft at the beginning of this session, she told me on Friday. Quick and Williams said they advised Ralston of the interest on the part of many in the county for a change in the redistricting approved in a special session of the General Assembly in 2011. They said they also presented Ralston a copy of the resolution passed by the Oconee County Board of Commissioners asking that the county be reunited before the 2014 elections. The Georgia House reapportioned itself in a special session in August of 2011, using the 2010 Census data. 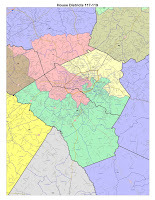 At that time, Doug McKillip was representing the old 115th House District, which fell entirely in Clarke County, and Williams, an Oconee County businessman and Republican, had just been elected to the old 113th District, which included all of Oconee County, as well as parts of Clarke, Morgan and Oglethorpe counties. McKillip, elected as a Democrat, was facing his first election as a Republican in a district that historically had voted Democratic. The Republican-dominated legislature created two districts with Republican voting histories. Quick, an Athens attorney, defeated McKillip, also an Athens attorney, in the July 2012 Republican primary. Quick, following on a promise she made during the campaign to seek to change the composition of the district, requested that House Legislative Counsel draft legislation to change the two House districts. The draft legislation moved Athens Academy, Malcom Bridge and Bogart precincts from the 117th House District to the 119th District, making all of Oconee County fall in the 119th. In Athens-Clarke County, Precinct 7C (Fire Station #3) was moved from the 119th District to the 117th District. Precinct 7A (Timothy Baptist Church), currently split between the two districts, became whole in the new 117th. Precinct 4B (Memorial Park), currently split between the two districts, would continue to be divided, but the lines would be redrawn. No changes were be made in the parts of the 117th District falling in Barrow and Jackson counties. The legislation that Quick had asked to be drafted was never introduced in the House. On Feb. 6, Rep. Randy Nix, LaGrange, chair of the House Reapportionment Committee, held the sole meeting of that body during the session which will end this week. “When I talked to the Speaker,” Nix told the Committee at that meeting, “he indicated there might be some things we may do next session. So we’ll just see what direction we have from him on that.” The Committee meeting was video recorded. Quick told me that she talked to Nix and Vice-Chair Susan Holmes on Feb. 6 after the Committee meeting. “I provided both of them with a copy of the resolution of the Oconee County Commission and a copy of the rules used for mid-decade reapportionment by the Reapportionment Committee beginning in 2006,” Quick said. Quick said she asked to be notified when the Committee developed rules as to how reapportionment requests would be handled in this session. "I promise Oconee County will be in the queue,” Quick said of the 2014 session. Williams said it was clear that nothing was going to happen in this legislative session on redistricting when he and Quick met with Speaker Ralston. “What we wanted to try to do is set steps for Oconee to be in a place at the front of the line” for next session, he said.